Sunday saw the 797th and final Cup start for Jeff Gordon, who came home 3rd in the championship after a late rally lifted him to 6th on the track. Gordon retires with six last-place finishes in NASCAR’s top three divisions. Looking at the circumstances of these finishes offers an intriguing view of how quickly he adjusted to stock car racing, and to the dedication of his team to get him back on track when things went sideways. Gordon’s first last-place finish came on April 13, 1991, in his eighth career XFINITY Series start at Bristol. Just 22 laps into the Budweiser 250, Gordon’s #1 Carolina Ford Dealers Ford lost an engine, taking him out of the race. It was to be Gordon’s only last-place finish outside of Cup. Much like Gordon’s debut in the Cup Series the next year, this race also saw a changing of the guard. 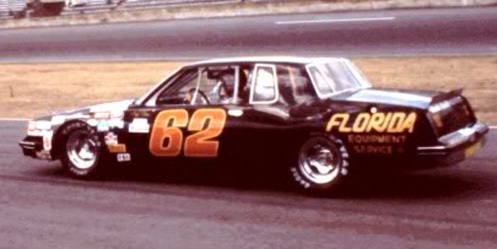 Three-time Sportsman champion and two-time XFINITY champion Jack Ingram failed to qualify for the second time that season and would ultimately retire from the tour at season’s end. Gordon’s next two last-place finishes came during his first full rookie season in Cup in 1993, and both were due to early crashes at the series’ two trips to North Wilkesboro Speedway. In the First Union 400 on April 18, Gordon’s rainbow-hued #24 DuPont Auto Finishes Chevrolet caught fire after backing into the Turn 1 wall on Lap 26. Then, during the Tyson / Holly Farms 400 on October 3, his 16th-place car was damaged in a seven-car opening-lap crash when the outside lane failed to get going on the green flag. Gordon parked the car with handling woes after running a quarter distance. Gordon got his revenge in 1996, winning the final Cup race yet run at the North Carolina short track. The next last-place run didn’t happen until the PRIMESTAR 500 on March 9, 1997, during the final race run on the Atlanta Motor Speedway’s 1.522-mile true oval configuration. Gordon lasted just 59 laps into the site of his first Cup start before the engine let go. It was to be the first of only two DNFs in an otherwise dominant 10-win season. When he returned to the Atlanta track for its reconfiguration in the fall, he again struggled to finish 17th, but still walked away with his second Winston Cup. The final two last-place finishes of Gordon’s career came at the Texas Motor Speedway, a track that vexed the champion after back-to-back early race crashes in the first two races run there in 1997 and 1998. While he managed to avoid finishing last in both races, he was not so fortunate during the spring races in 1999 and 2008. The first finish on March 28, 1999 was another crash, a solo shunt into the Turn 4 wall after 68 laps. The other on April 6, 2008 saw Gordon fighting handling woes once again after a crash in the same spot on Lap 110. Again, just as he had at North Wilkesboro, Gordon soon managed to solve the Texas puzzle, winning his lone race there in 2009. Gordon remains the only driver in NASCAR history to win both a NASCAR Sprint Cup Championship and a LASTCAR title, the latter coming during his first Cup season in 1993 after a bottom-ten tiebreaker with ARCA veteran Bob Schacht. On top of his 93 victories and countless other impressive statistics, it is perhaps this quick turnaround from challenger to champion that is most impressive of all. Jeff Green picked up the 83rd last-place finish of his NASCAR XFINITY Series career in Saturday’s Ford EcoBoost 300 at the Homestead-Miami Speedway when his #19 Premier Barter Exchange Toyota fell out with transmission problems after 3 of 200 laps. The finish, which came in Green’s 420th series start, was his 23rd of the 2015 season. He shatters his own record for the most last-place runs in a season by a NASCAR driver - 15, which he set in the 2013 XFINITY Series season, and is now a five-time LASTCAR champion. By rounding out the 2015 season with six consecutive last-place finishes, Green can also break his record of eight lasts in a row if he sweeps the opening three rounds in 2016. Green was 36th-fastest in the series’ final practice session of the season and timed in 27th in qualifying with a speed of 161.310 mph. The lone driver who missed the field was Morgan Shepherd, whose #89 Racing With Jesus Chevrolet ended up with its seventh DNQ of the season. Starting 40th on Saturday was ARCA driver Tim Veins, who after making his Truck Series debut at Dover this past May rejoined Mike Harmon to drive his #74 RaceDaySponsor.com Dodge. On Lap 4, Green pulled behind the wall and secured the 40th spot while Viens, who spun in Turn 1 on Lap 11, recovered to ended up 33rd at the finish, the final car to come home under power. The remaining members of the Bottom Five retired from the race between the start and the third caution for Josh Reaume hitting the Turn 4 wall in Motorsports Business Management’s #40 Braille Battery / Grafoid Chevrolet, the next lapped car to finish ahead of Viens. 39th went to T.J. Bell, his sixth-straight bottom-five finish in JGL Racing’s #26 Toyota. 38th was B.J. McLeod, his second-straight bottom-five finish for King Autosport in the #92 Bucked Up Apparel Chevrolet. Mike Bliss, Green’s teammate and the defending LASTCAR Cup Champion, was 38th in TriStar’s unsponsored #14. Rounding out the group in 36th was Carlos Contreras, who lost the engine on Rick Ware’s #15 BYBExtreme.com Chevrolet. *This is Green’s third last-place finish in an XFINITY Series race at Homestead, joining finishes in 2010 and 2014. 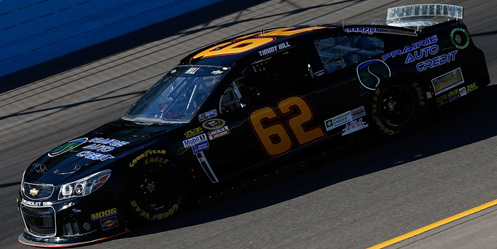 Timmy Hill picked up the 4th last-place finish of his NASCAR Sprint Cup Series career in Sunday’s rain-shortened Quicken Loans Race For Heroes 500 at the Phoenix International Raceway when his #62 Prairie Auto Credit / Financial Concepts Chevrolet finished under power, but 91 laps down, after 127 of 219 circuits. The finish, which came in Hill’s 47th series start, was his first since August at Michigan, 12 races ago, and is his second for Premium Motorsports - the other in the #98 which Premium acquired from Phil Parsons Racing this past summer. Hill was pulling triple-duty at the Phoenix track. In addition to running Premium’s #94 in the Truck Series, where he finished 18th, as well as Premium’s #62 in Cup, he also brought Tom Kapusta’s XFINITY Series team back to the track for the first time since the spring race at the Arizona track. 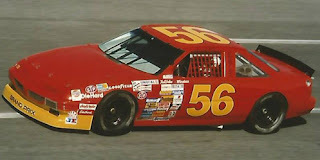 The race, where Hill finished 27th, had added meaning as he would run the same #56 his father Jerry Hill ran in Sprint Cup and ARCA in the early 1990s. With 43 cars on the Sprint Cup entry list, Hill was guaranteed a starting spot for Premium’s #62. It would be just the 16th start of the season for the car in a year where it had missed the show 19 other times. However, in that span, Hill got the car into the field the last seven-straight times and accounted for only four of the DNQs. With another driver tabbed to run the #62 at Homestead, Hill looked to make the most of his final start of the season in a car which carried new sponsorship from two backers. Hill was slowest in Friday’s opening practice and was set to roll off shotgun on the field with a speed of 131.507 mph. On Saturday morning, he remained the slowest in the second practice session as well as Happy Hour. Hours of delays pushed the start of Sunday’s race well after sunset, and when the green flag finally flew, Hill remained at the back of the field for the opening eight laps. Then, on Lap 9, outside-polesitter Kurt Busch ended up 43rd after serving a penalty for jumping polesitter Jimmie Johnson in his #41 Haas Automation Chevrolet. Busch re-passed Hill on Lap 13, and the next time by, Hill was the first to lose a lap to Johnson, then a second on Lap 31. He remained in 43rd through the first competition caution on Lap 42. On the Lap 48 restart, teammate Ryan Preece in the #98 Xyience Ford had fallen to 43rd, then briefly conceded it the next time by to Joey Gase, who was making his Cup third start of the season and first since Kansas in May in the #32 R Factor 2 Ford for Go Green Racing, successfully rebounding from a DNQ last week in Texas. Just short of the one-third mark, however, Hill retook the 43rd spot when he went behind the wall with engine trouble. Although Hill reported on Twitter that the motor had let go due to a dropped valve, the #62 returned to the track 91 laps down, joined soon after by Gase, who remained laps down in 42nd after brake issues sent him to the garage. The second and, ultimately, final caution of the night played a critical role in both the NASCAR and LASTCAR championship battle. When Ricky Stenhouse, Jr.’s #17 Cargill Ford lost the brakes in Turn 3 and slammed Gase’s wounded #32 into the outside wall, both cars were out of the race, giving Hill a chance to pass Gase if he ran approximately 40 more laps. However, the final red flag came out when Hill was still 35 laps away from catching Gase, keeping the #62 at the back of the field. The race was soon called, and it was Hill, not Gase, who ended up with his second last-place run of 2015. Rounding out the Bottom Five behind Gase and Stenhouse were 40th-place Ryan Ellis in Circle Sport’s #33 Science Logic Chevrolet and the #23 Dr. Pepper Toyota of Jeb Burton, both laps down to race winner Dale Earnhardt, Jr. For Ellis, it was his Sprint Cup debut after 29 XFINITY Series and 20 Truck Series starts. A lifelong Jeff Gordon fan, Ellis got to race against his hero in his penultimate event exactly 23 years to the day that Gordon made his own Cup debut in Richard Petty’s last. 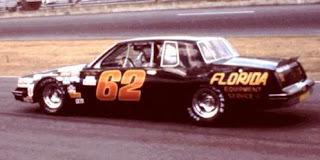 *This was the first last-place finish for the #62 in a Sprint Cup Series race since July 4, 1981, when Rick Wilson’s #62 Florida Equipment & Service Oldsmobile started 8th in the Firecracker 400 at Daytona, but lost the engine after only 8 laps. Cale Yarborough edged Harry Gant for the race win. Seven years later, when driving for Morgan-McClure Motorsports, Wilson earned a career-best runner-up in the same race after a photo finish with Bill Elliott. *This is the first last-place finish for both Hill and the #62 in a Cup race at Phoenix. Next week at Homestead, the LASTCAR Cup Series Championship will be decided between four-time last-placer Landon Cassill and three-timer Alex Bowman. Two-time last-placers Michael Annett and J.J. Yeley were eliminated from contention at Phoenix when both did not finish last and came home 32nd and 29th, respectively. Both Cassill and Bowman finished outside the Bottom Five in 35th and 38th, respectively - Bowman edged by Jeb Burton for 39th by a single lap. This means that if Bowman finishes last at Homestead while Cassill finishes 38th or better, Bowman will take the LASTCAR title by a single bottom-five finish, 8-7. Otherwise, Cassill will either claim the title outright or by a bottom-ten tiebreaker of at least 14-10. 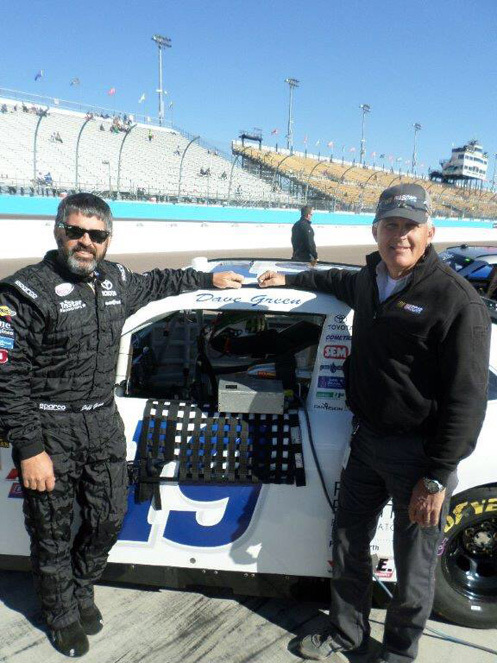 Jeff Green picked up the 82nd last-place finish of his NASCAR XFINITY Series career in Saturday’s DAV 200 Honoring Americas Veterans at the Phoenix International Raceway when his #19 Premier Barter Exchange Toyota fell out with rear gear issues after he completed 3 of the race’s 200 laps. The finish, which came in Green’s 419th series start, was his 22nd of the 2015 season, his fifth in a row, and his seventh in the last nine races. He can extend both streaks with another 40th-place run in next week’s Homestead finale, an event he trailed for TriStar in 2010 and 2014. The Green family raced with heavy hearts after the passing of David, Mark, and Jeff’s father David “Dave” Lee Green passed away on November 1 at the age of 77. In his memory, Green’s #19 carried Dave’s name over the driver’s side window. Green did not participate in Friday’s opening practice, but returned to put up the 30th-fastest time in Happy Hour, then improved to 25th in qualifying with a lap of 131.670 mph. Missing the race were Morgan Shepherd - his eighth of the season and first since Chicagoland - and late model racer Matt Waltz, whose first XFINITY Series attempt ended after he found the Turn 4 wall in qualifying driving Derrike Cope’s #70 Ehydrate / Ashurt American Honey Chevrolet. At the start of Saturday’s race, Green pulled behind the wall after three circuits, followed six laps later by Carl Long, who was making his first start since Dover in early October as driver of Motorsports Business Management’s #40 Braille Battery / Grafoid Dodge. 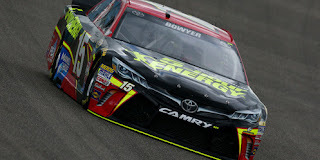 Long’s teammate, NASCAR Mexico Series star Ruben Pardo, brought out the first caution when he lost the engine on the #13 BYB Extreme Fighting Series Toyota. Rounding out the Bottom Five were two team cars - the second King Autosport entry, the #92 CrashClaimsR.us Chevrolet of B.J. McLeod, and T.J. Bell in JGL Racing’s #26 Toyota. Both McLeod and Bell exited the race during the Pardo caution. *This was Green’s fifth last-place finish in an XFINITY Series race at Phoenix, including a season sweep for 2015 in both the #10 and the #19. 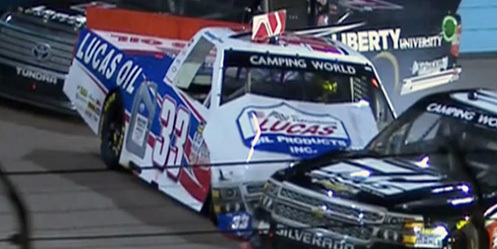 Brandon Jones picked up the 1st last-place finish of his NASCAR Camping World Truck Series career in Friday’s Lucas Oil 150 at the Phoenix International Raceway when his #33 Lucas Oil Chevrolet was involved in a three-truck accident after 6 of 150 laps. The finish came in Jones’ 24th series start. A two-time winner in ARCA and 4th in the 2014 K&N Pro Series East Championship standings, 18-year-old Jones is already in his third partial season in the Truck Series. Jones entered the series with Turner Motorsports in 2013, then in late 2014 moved to the growing GMS Racing team owned by Maury Gallagher. As one of a number of part-time teammates to GMS’ primary #23 fielded by ARCA star Spencer Gallagher, Jones earned a career-best 2nd to Erik Jones at Iowa this past June, one of five career Top Fives and nine Top Tens. At Phoenix, Jones looked to improve on a 12th in his only previous Truck Series start at the track in late 2014. He ran a strong 3rd in Thursday’s practice session, trailing only Jones and oerall leader Cameron Hayley, then qualified 7th at an average speed of 136.090 mph. Starting 32nd on Friday was Akinori Ogata, making his third start of the season in MB Motorsports’ #63 ENEOS Chevrolet. Ogata was joined by three trucks sent to the rear - Tyler Young in his family’s #02 Randco / Young’s Building Systems Chevrolet, the #74 Mike Harmon Racing entry of Jordan Anderson, and Corbin Forrister in the #08 Tilted Kilt Chevrolet. By the end of Lap 1, all of them moved past Timmy Hill, who briefly trailed the field in Premium Motorsports’ #94 Testoril Chevrolet before Forrister fell to the back on Lap 4. Forrister was still trailing when trouble broke out on the backstretch. Coming off Turn 2, Jones was locked in a battle to defend his 7th starting spot on the outside from K&N East Series racer William Byron, making his series debut in the #9 Liberty University Toyota for Kyle Busch’s team, and on the inside from Cole Custer’s #00 Haas Automation Chevrolet. While negotiating the dogleg, Jones made contact with Byron’s Toyota and was hooked directly into Custer’s right-front, triggering a wreck that sent all three vehicles into a spin. Jones and Byron’s trucks, the most severely damaged, were done for the night, and Custer required laps of repairs before returning to the race and finishing 26th. 30th went to Forrister, who was bumped into a spin by Hill coming off Turn 4 on Lap 17. Anderson’s #74 lost an engine and stalled in Turn 4 on Lap 40, drawing the third caution of the night. The Bottom Five was rounded out by fan favorite Rico Abreu, whose own Truck Series debut faced a sudden end on Lap 46 when he was caught up in a wreck between three other trucks. The short tracker’s #31 AccuDoc Solutions Chevrolet suffered nose damage in the accident, ending his night. 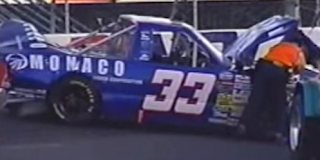 *This was the first last-place finish for the #33 in a Truck Series race since August 6, 2004, when Michael Waltrip’s #33 Monaco Coaches Chevrolet fielded by Andy Petree Racing was involved in a crash after he completed 14 of the 200 laps in the Power Stroke Diesel 200 at Lucas Oil Raceway in Indianapolis. The number has never finished last in any other Truck Series points races. *This was the first last-place finish for GMS Racing in NASCAR’s top three divisions. Before Friday’s race even started, the four challengers for the 2015 LASTCAR Truck Series Championship were whittled down to two. 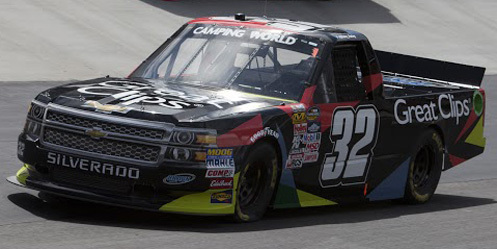 Eliminated from contention were Justin Jennings, who was not on the entry list (substituted at MB Motorsports by Bobby Pierce in the #36 and Akinori Ogata in the #63), and Norm Benning, who scored his third DNQ of 2015. Like Jennings, MB Motorsports teammate Tyler Tanner wasn’t on the list, but Tanner can win the title simply by finishing last at Homestead. If Tanner comes home 32nd, it won’t matter where Roark finishes in the race. If Roark finishes outside the Bottom Ten, Tanner will win a bottom-ten tiebreaker, 9-8. If Roark finishes inside the Bottom Ten, Tanner will still win a bottom-fifteen tiebreaker, 10-9. 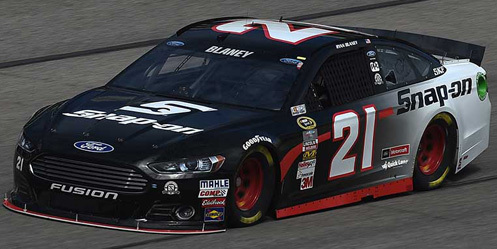 Ryan Blaney picked up the 2nd last-place finish of his NASCAR Sprint Cup Series career in Sunday’s AAA Texas 500 at the Texas Motor Speedway when his #21 Snap-On Tools Ford was involved in a single-car crash that ended his run after 26 of 334 laps. The finish, which occurred in Blaney’s 17th series start, was his first since Talladega, two races ago. Texas was Blaney’s first Cup start since the last-place run at Talladega, the Wood Brothers team passing on the race at the Martinsville track near the team’s birthplace near Stuart, Virginia. While Blaney had finished 2nd, 8th, and 3rd in his three XFINITY Series starts at the 1.5-mile quad-oval, an early engine failure in the Cup race this past spring left him 42nd, when he was edged for last by J.J. Yeley. In what turned out to be the weekend’s only practice session for the 45 entered Cup drivers, Blaney put up the 7th-fastest time overall, besting half of the Chase field. Qualifying proved less fruitful, however, as Brian Scott edged him by six-thousandths of a second for the final spot in Round 2. He would start Sunday’s race 25th with an average speed of 195.525 mph. Missing the show were Reed Sorenson, his #62 Premium Motorsports entry the slowest to take time, and the #32 ZAK Products / Donate Life Texas Ford of XFINITY Series regular Joey Gase, who was looking to make his first Cup start since Kansas in May. Starting 43rd on Sunday was Justin Allgaier, whose HScott Motorsports teammate Michael Annett suffered the latest in a series of yet-unexplained hauler fires. While no one was injured in the fire, Annett’s Texas cars were destroyed, and the Iowa driver rolled out 37th in Allgaier’s backup. By the end of Lap 1, 42nd-place starter Ryan Preece fell to last in the #98 Xyience Chevrolet. Preece was still running in the back on Lap 10, when the first caution fell with championship implications. Joey Logano qualified 4th in his #22 AAA Insurance Ford and was a favorite to lock himself into the Championship Round of the Chase with a win. In the aftermath of NASCAR’s controversial two-race suspension of Matt Kenseth, who had wrecked Logano at Martinsville in retaliation for his own championship-ending incident at Kansas, the Texas crowd cheered on Lap 11 when Logano’s #22 spun by himself on the apron of Turn 3 with a cut left-rear tire. The tire shredded away sheet metal and foam from the inside of his car, and after turning one more lap, the Penske Racing crew pulled Logano behind the wall. Logano was the first driver to lose a lap as he quickly took 43rd from Preece. The race restarted on Lap 18, but just eight circuits later the caution fell once more. This time, Blaney was the victim, his #21 contact with the wall off Turn 4 cutting a tre before he slowed with heavy right-front damage in Turn 2. The Wood Brothers team pulled Blaney’s ride to the garage to join Logano, and soon after his Ford was listed out of the race. Logano returned to the track on Lap 76, his damaged ride 64 circuits back of the leaders, and on Lap 92, Blaney fell to last in the final change for 43rd. Logano made it to only 40th at race’s end, and with the other seven Chase drivers finishing inside the Top 10 combined with teammate Brad Keselowski’s narrow loss to Jimmie Johnson, both Penske Racing cars need to win at Phoenix to make the title fight at Homestead. 42nd went to Tony Stewart, who narrowly avoided his first last-place run since Watkins Glen when his #14 Bass Pro Shops / Mobil 1 Chevrolet lost control and dug into the infield grass on Lap 53. 41st went to Alex Bowman, who Logano nipped in the final laps when the LASTCAR runner-up’s #7 Nikko / Road Rippers Chevrolet lost an engine. 39th went to Trevor Bayne, whose #6 AdvoCare Ford was among the many other victims of cut or blown tires, his triggering the eighth yellow on Lap 198. *This is the first last-place finish for the #21 in a Cup Series race at Texas. The Wood Brothers team also never finished last in any of the eight Cup races held at the old Texas World Speedway in College Station from 1969 through 1981. The team’s best run at the two-mile track was by A.J. Foyt, whose Purolator Mercury started on pole and came home 2nd on November 12, 1972. With two races to go, Landon Cassill’s only challengers mathematically eligible for the 2015 LASTCAR Cup Series Championshp are Alex Bowman, Michael Annett, and J.J. Yeley. Bowman can only control his destiny by sweeping both last-place finishes at Phoenix and Homestead, thus taking the lead from Cassill outright. He can also win with just one more last-place finish, but only if Cassill doesn’t finish inside the Bottom Five in either race - Bowman is currently tied with Cassill with 7 Bottom Fives apiece, but trails Cassill in Bottom Ten finishes, 14-10. Annett and Yeley can claim the title by sweeping the final two last-place runs no matter where Cassill finishes. Annett already leads Cassill on Bottom Fives, 8-7. Yeley, who has matched Cassill’s 7 bottom-fives, leads Cassill in Bottom Tens by an insurmountable 21-14. At least one of these two drivers will be eliminated by not finishing 43rd at Phoenix, and both will fall from contention if they both come up short. While Ryan Blaney now sits in a five-way tie for third in the LASTCAR standings and can match Cassill’s four finishes with a sweep of the final two 43rd-place runs, he has been mathematically eliminated from title contention along with the remaining two-timers - Aric Almirola and Kasey Kahne. Almirola and Kahne have only 2 and 3 bottom-five finishes to Cassill’s 7, preventing a successful tiebreaker on Bottom Fives. Blaney, meanwhile, has 5 Bottom Fives, but due in part to his limited schedule trails Cassill in Bottom Tens 14-5. Blaney is also not listed to run in next week’s Cup race at Phoenix, making a two-race sweep impossible. 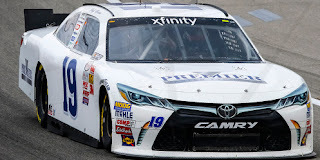 Jeff Green picked up the 81st last-place finish of his NASCAR XFINITY Series career in Saturday’s O’Reilly Auto Parts Challenge at the Texas Motor Speedway when his #19 Premier Barter Exchange Toyota fell out with transmission issues after he completed 4 of 204 laps. The finish, which came in Green’s 418th series start, was his 21st of the 2015 season, his fourth in a row, and his sixth in the last eight races. It is the second four-race last-place streak of Green’s XFINITY Series career, matching the streaks in August 2011 and July-August of this year. As the XFINITY Series returned to action for the first time in three weeks, Green rejoined a list of 40 entrants for 40 spots in the second event of the Texas race weekend. Green put his #19 34th in Friday’s lone practice session and remained in that spot for the race after qualifying was cancelled by rain. During the opening 26 laps of green-flag racing, four drivers pulled behind the wall, led by Green on Lap 5. Four laps behind him was Canadian owner-driver Mario Gosselin, who started last in his #92 Bucked Up Chevrolet while Martin Roy ran the full race in King Autosport’s #90 Gamache Truck Center / Cote Chevrolet. 38th spot went to T.J. Bell, his fourth-straight bottom-five finish in JGL Racing’s unsponsored #26 Toyota. 37th belonged to Motorsports Business Management with Josh Reaume in Derek White’s #40 Lodestar Guidance / VictoryWeekend.com Dodge - Reaume’s first XFINITY Sries start since last month at Charlotte, when he took a turn for JD Motorsports. 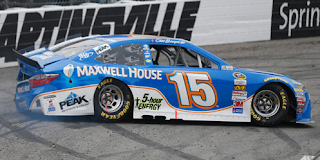 Rounding out the Bottom Five was the #14 Toyota, one of Green’s teammates at TriStar Motorsports. Through the season’s first 30 races, West Virginian short tracker Cale Conley competed with limited funding for his second season on the tour, carrying logos representing the Iraq & Afghanistan Veterans of America. 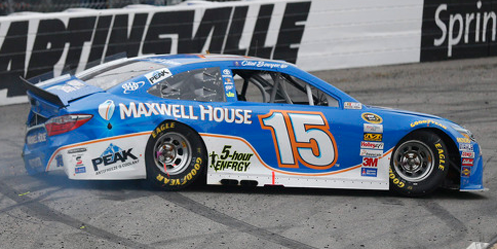 Despite making all the races and finishing a season-best 16th, however, sponsorship woes took Conley out of this ride. Mike Bliss, who earlier this year at Iowa was similarly excused from TriStar’s #19, found himself back with the team in a now-unsponsored #14. Bliss ran more laps than any other driver in the Bottom Five, turning 40 in total before officially exiting with transmission issues. *This marks Green’s fourth last-place finish in an XFINITY Series race at Texas, but his first in the fall race. It is also the first time the #19 has trailed an XFINITY Series race at the track. Caleb Roark picked up the 7th last-place finish of his NASCAR Camping World Truck Series career in Friday’s WinStar World Casino & Resort 350 at the Texas Motor Speedway when electrical issues prevented his #0 Driven2Honor.org Chevrolet from completing any of the 147 laps. The finish, which occurred, in Roark’s 23rd series start, was his first since Pocono, 9 races ago and breaks a three-way tie with Norm Benning and Tyler Tanner for the 2015 LASTCAR Truck Series lead. 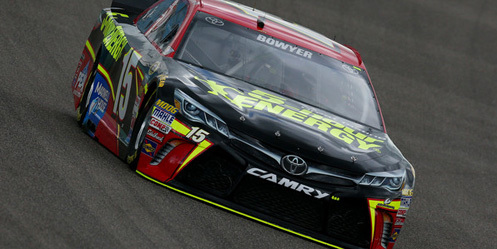 With two races to go, Roark is now in position to claim his second-straight LASTCAR title. Roark’s truck made it an even 32 for as many spots in Friday’s field, and he was guaranteed to make his first series start since last month’s 30th-place finish at Las Vegas. With just one lap turned in Thursday’s opening practice, Roark was 29th-fastest overall, and in Happy Hour later that day, he failed to complete a lap at all. One week after engine issues cancelled Brad Foy’s series debut in the truck, electrical issues now reared their ugly head, and the #0 was now having issues starting. These issues persisted in qualifying, and when time expired on the five-minute clock, he was unable to put up a time and was set to roll off 31st. With just one caution on the night, Friday’s race was the fastest in series history, and the last-place battle ended just as quickly - Roark’s electrical issues prevented him from completing a lap. Roark managed to edge fellow LASTCAR contender Tyler Tanner, whose backup #36 Mittler Bros. Machine & Tool Chevrolet for MB Motorsports lost an engine in practice, and the team couldn’t get a functioning backup. Both Roark and Tanner were six laps behind 30th-place Mike Harmon, who debuted a second unsponsored truck of his own, #49, which he drove in addition to Jordan Anderson’s 21st-place #74 Columbia, South Carolina / Knight Fire Protection Chevrolet. 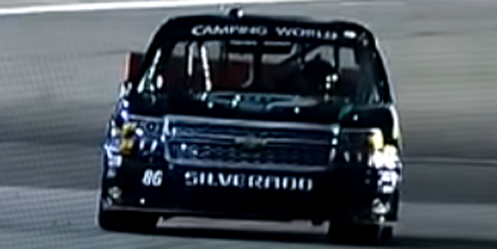 MAKE Motorsports again had both trucks in the show, and this time former XFINITY Series driver Dexter Stacey pulled the team’s unsponsored #50 Chevrolet behind the wall after 11 laps. Rounding out the Bottom Five was Todd Peck, who was making his first series start since coming home next-to-last at Michigan in June. Peck’s family-owned team, which ran the #40 earlier this season, on Friday became the third different program to run the #45 in the series in 2015. 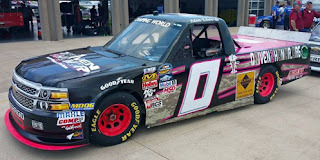 *Jennifer Jo Cobb Racing’s #0 has swept both last-place runs at Texas in 2015 and has trailed in four of the last five Truck Series races held at the track. With two races to go, four drivers remain in contention for the LASTCAR Truck Series Championship - joining Roark are Tyler Tanner, Norm Benning, and Justin Jennings. Three-time last-placers Norm Benning and Tyler Tanner can only control their own destiny by finishing last at both Phoenix and Homestead, taking the lead outright. Benning will be eliminated if he doesn’t finish last at Phoenix - he trails Roark in bottom-fives 8-4 and cannot rely on a tiebreaker. Tanner can finish last in one race and prevail in a tiebreaker if Roark fails to finish in the Bottom Ten in both races - in that situation, Tanner would match Roark’s 8 Bottom Fives, but prevail by a single Bottom Ten, 9-8. This will be challenging, however, as Roark’s “start-and-park” ride has not finished outside the Bottom Ten all season. Two-time last-placer Jennings has a good chance of winning the title, but only if he sweeps the final two last-place finishes of the season. Jennings currently has 9 bottom-five finishes and 13 in the Bottom Ten, meaning that if he ties Roark, Tanner, or Benning, he will win either tiebreaker no matter where those three drivers finish in both races. It would be a surprising development after this site prematurely awarded Jennings the title after Phoenix in 2014. Meanwhile, Jennifer Jo Cobb, who also has two last-place finishes and 11 Bottom Tens, has been eliminated from LASTCAR contention. Cobb has just 3 Bottom Fives in 2015 and, even with a two-race sweep, cannot win the tiebreaker against Roark’s season total of 8. Cobb’s two-truck team, however, has now clinched the 2015 LASTCAR Truck Series Owner’s title by three finishes over Mike Mittler and Norm Benning. J.J. Haley picked up the 1st last-place finish of his NASCAR Camping World Truck Series career in Saturday’s Kroger 200 at the Martinsville Speedway when his #32 Great Clips Chevrolet was involved in a single-truck crash that ended his run after 119 of 200 laps. The finish came in Haley’s second series start. A sixteen-year-old development driver for Braun Motorsports, Haley has moved from quarter midgets to a number of sporadic starts in NASCAR. In 2014, Haley competed in ARCA and both the West and East divisions of the NASCAR K&N Pro Series. This year, Haley has earned a combined nine top-five finishes across the three divisions and made the move to NASCAR’s top three divisions. His Truck Series debut came two months ago at Bristol, where he came home a solid 14th. Martinsville would be his next attempt. A season-high 39 drivers were on Martinsville’s preliminary entry list - so many, in fact, that three withdrew in the lead-up to qualifying. On Friday, B.J. McLeod’s #45 Tilted Kilt Chevrolet was pulled along with MB Motorsports’ “start-and-park” #36 entry, which did not have a listed driver. The withdrawals followed the once-again late entries fielded by MAKE Motorsports, who this week put Camden Murphy in the #1 and Travis Kvapil in the #50. Late model racer Brad Foy looked to make his NASCAR debut in Jennifer Jo Cobb’s #0 Driven2Honor.org Chevrolet. Foy entered the race while grieving from a devastating tragedy - his father Brian was murdered in May when burglars broke into his home. Foy turned in the 31st-fastest time in the opening practice session, outpacing Cobb’s locked-in truck that was 36th, but an engine failure forced the team to pull his entry. Haley ran 22nd in the opening session and 20th in Happy Hour before he secured the 22nd starting spot with a speed of 94.200 mph. The four drivers who missed the field were led by Norm Benning, who scored just his second DNQ of the year and his first since New Hampshire. Benning is still tied for the lead in the 2015 LASTCAR Truck Series Championship, but his four bottom-five finishes trail co-leaders Caleb Roark’s 7 and Tyler Tanner’s 6. Joining Benning were Brandon Brown, his fourth DNQ of his sophomore season, Chuck Buchanan, Jr., his fourth unsuccessful attempt to make his series debut, and K&N West Series driver Jimmy Weiler, the 42-year-old Sonoma, California driver missing the cut in his first series attempt. Starting 32nd in Saturday’s race was Cobb, who ran an old Chevrolet body on her #10 Driven2Honor.org-sponsored entry. Cobb was among the first drivers to lose a lap, and by Lap 100 was joined by only two other lapped machines with drivers making their first series starts: Louisiana’s Brandon Hightower in MB Motorsports’ #08 St. Jude Children’s Hospital / Operation 2nd Chance Chevrolet and Wisconsin short tracker Paige Decker in Mike Harmon’s #74 Eagle River Derbytrack RAM, returning from a DNQ in the spring race. Decker and Hightower both spun in the early stages with Decker taking last from Cobb as the trio lost laps. The #74 was still trailing the field on Lap 120 when trouble broke out in Turn 1. 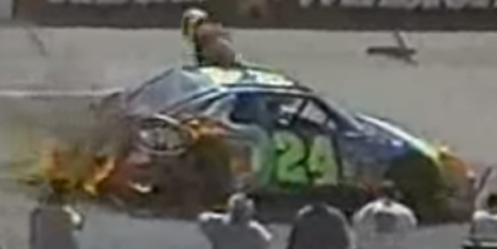 That time by, J.J. Haley was running on the lead lap in 26th when his brakes failed going into the first corner. His truck switched ends and backed hard into the outside wall, stopping the machine against the outside wall. Haley was uninjured, but his truck was too damaged to continue, and he became the first - and only - retiree from the event. Cobb and Decker finished under power in the next two spots while Hightower climbed to 27th. 29th went to Spencer Gallagher, whose #23 Allegiant Travel Chevrolet briefly entered the Top 5 on old tires only to be involved in his second-straight late-race accident with just six laps to go. Rounding out the Bottom Five was 17-year-old K&N Pro Series West rookie Dalton Sargeant, who brought out three cautions in the #5 Galt Toyota. *This is the first last-place finish for the #32 in a Truck Series race since March 12, 2011, when Brad Sweet’s own turn in the Great Clips Chevrolet - then fielded by Turner Motorsports - crashed after 13 laps of the Too Tough To Tame 200 at Darlington. The number had never before finished last in a Truck Series race at Martinsville.